I don’t have a lot of art and I sure wish I had a lot more, but with a small apartment and the school bills to pay, it can be tough to acquire pretty pictures to hang around the place. Thankfully, I purchased this piece before I started school, when I had a bit more moolah in the wallet. 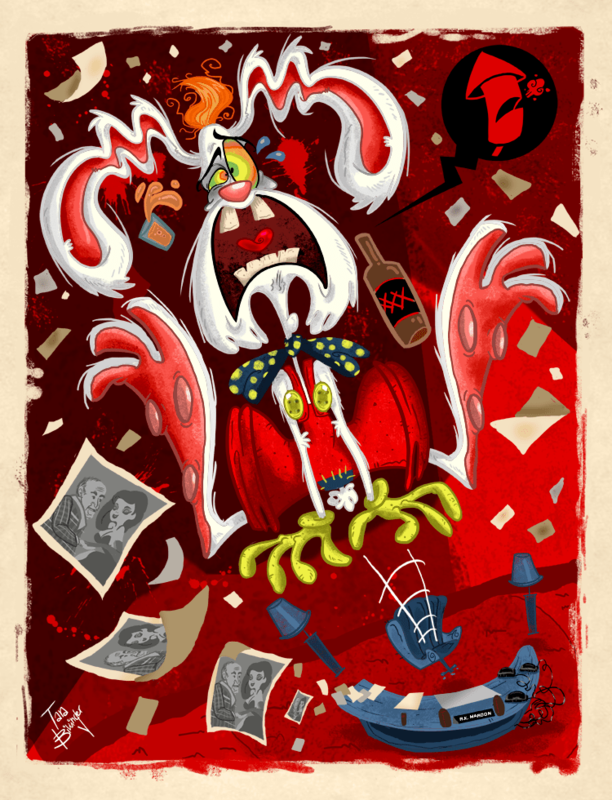 As you can see, it’s clearly Roger Rabbit and it’s also painted by none other than Tara Billinger!!! There’s a lot to love about this piece, it’s from one of my favourite movies, it’s in Tara’s unmistakable style, Roger is clearly going off his nut and there are some very nice shades of red to boot. Check out Tara’s creation process here. On top of that, it’s all original. I’m one of those people who appreciate art because it’s nice to look at, not because it’s made by some high-flying artiste and I would much rather appreciate something like this than a run-of-the-mill poster or what have you. So she didn’t create the character, so what? She made this awesome picture from the film that inspired her and gives me something nice to talk about when we have guests over. What I like best about it though, is the satisfaction I get from knowing that by buying it, I supported an artistic organization and artist. There was no auction house, no art dealer, just Tara and I (although the comic book shop in Philly along with The Autumn Society helped put together the show that the piece was in). Just knowing that I’m helping individual artists makes me feel all warm and fuzzy inside. There are literally tons of similar art being made out there right now, so before you consider dropping hundreds of dollars (or more) on that next “limited edition cel”, perhaps consider buying some real, original art instead.